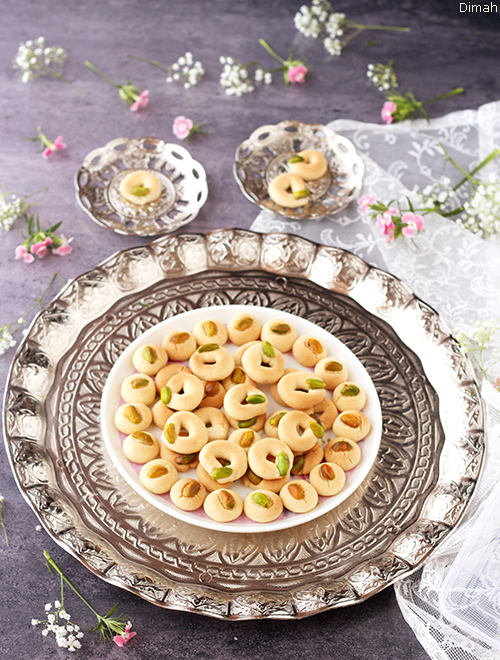 Ma’amoul Abiad is one of the sweets prepared for Nisf Sha’aban. 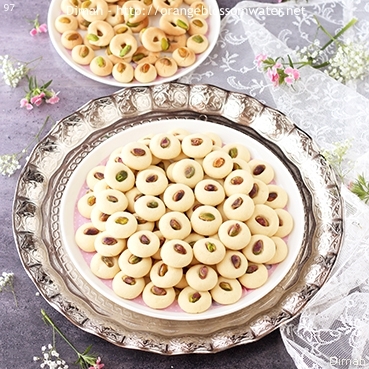 “Ma’amoul Abiad” means “White Ma’amoul” because the color of the cookies should remain white in baking, a specialty of Hama . In other cities, “Ghraibeh” is similar to Ma’amoul Abiad but baked to golden brown in color. 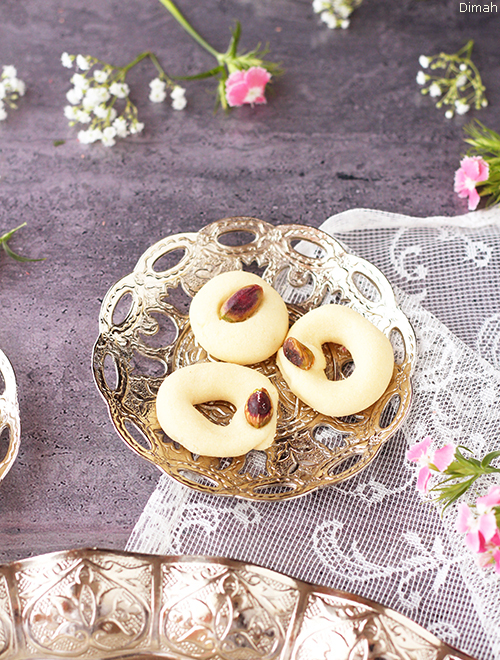 These cookies are very delicate, they melt immediately in your mouth. 1, 2, 3, 4. In a bowl, measure 120 g powdered sugar . 5 to 10. Add 250 g ghee to powdered sugar. Good quality ghee is required, I used 125 g Lurpak and 125 g Aseel. 11, 12, 13, 14. 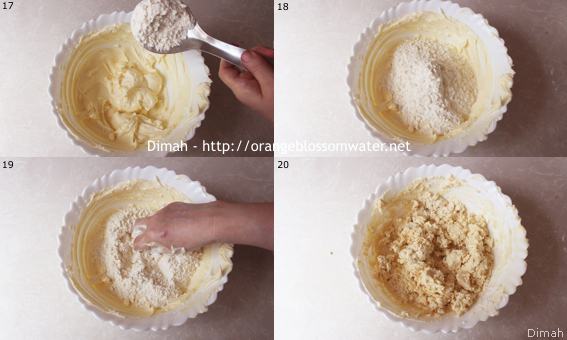 Mix powdered sugar and ghee with your hand until creamy and the color of the mixture turns to pale off-white as in picture 14. 15 to 24. 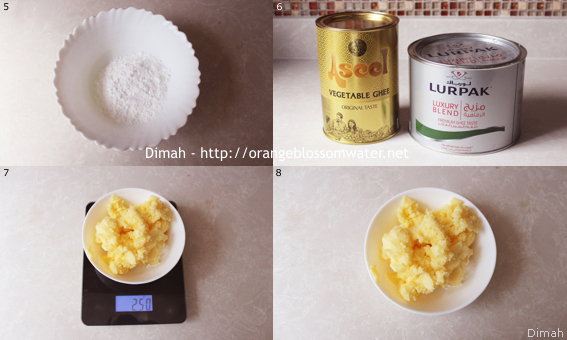 Gradually add 500 g flour to the mixture of powdered sugar and ghee, mix the ingredients with your hand between each addition. 25, 26, 27. 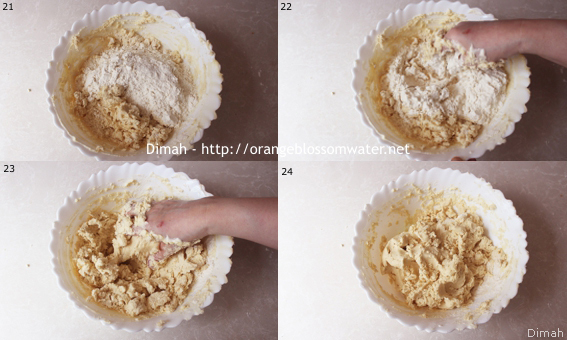 Knead with your hand until a dough comes together and homogeneous. 28. Cover the bowl with plastic wrap, and set the dough aside in the refrigerator for 24 hours. After 24 hours, take the dough out of the refrigerator and leave it at room temperature for 1 hour. 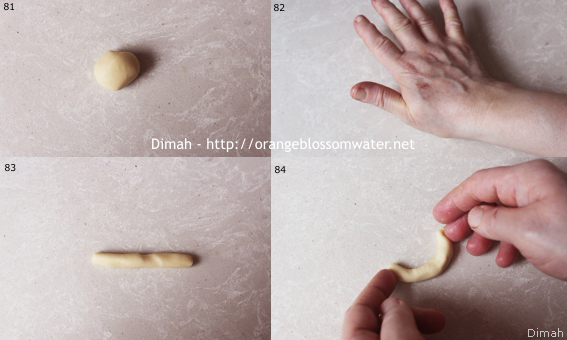 Touch the dough, it should be pliable but not too soft. 29. Prepare a baking sheet. 30, 31. 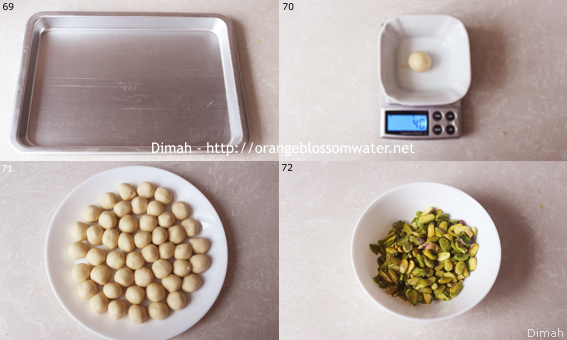 Take a piece of dough and form it into ball, each ball equals to 6 grams. Keep the dough balls covered with plastic wrap or it will dry out. 32. Prepare whole pistachio kernels, and set aside. 33, 34, 35. 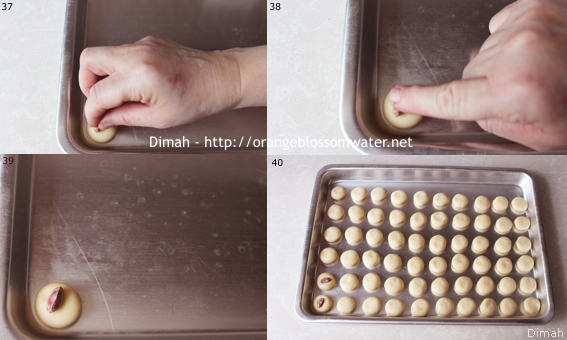 Take a ball of dough and flatten with you palm into disc approximately 1/4 inch (0.5 cm) thick. 36. Place on ungreased baking sheet. 37, 38, 39, 40. 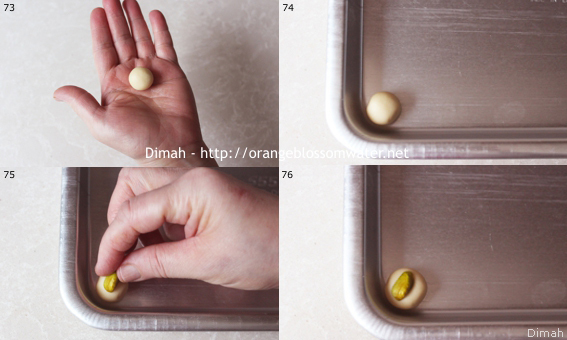 Put whole pistachio kernel in the center of the cookie and slightly press it with your finger. 41, 42, 43, 44. Repeat the steps. 45, 46, 47. Take the ball, put it on counter, move your palm just in one direction and form it into rope equals to 2 1/2 inches (6 cm). 48, 49, 50. Form the rope into a ring joining the two ends and pressing to seal. 51. Place on ungreased baking sheet. 52, 53, 54. Put whole pistachio kernel in the joining end of the cookie and slightly press it with your finger. 55, 56. Repeat the steps. 57 to 64. Heat the oven at 300°F (150 °C) (I’ve done this step of heating oven 15 minutes before placing the baking pan in oven to bake). Place the baking pan in the oven (rack position the second from bottom), and bake for 10 minutes or until the bottom becomes light golden in color. Turn off the bottom burner “bake function”, then turn on the upper burner on low and bake for 4 minutes, the color of Ma’amoul should stay white. 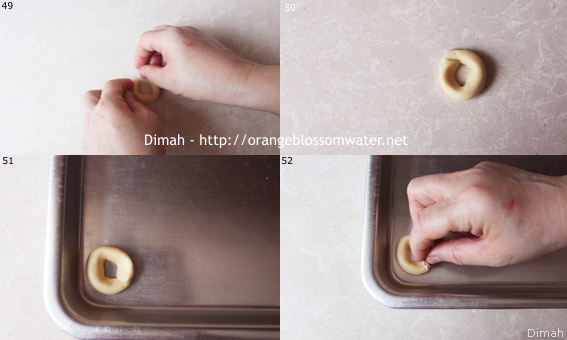 To check if Ma’amoul is done, touch with your finger and it should be clear and no crumbs stick on it. 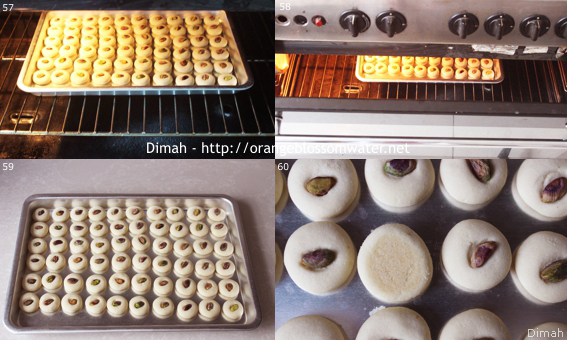 When done, turn off oven, keep Ma’amoul in oven with door open for 1 minute. Remove from the oven and keep on baking sheet to completely cool. 65, 66, 67, 68. 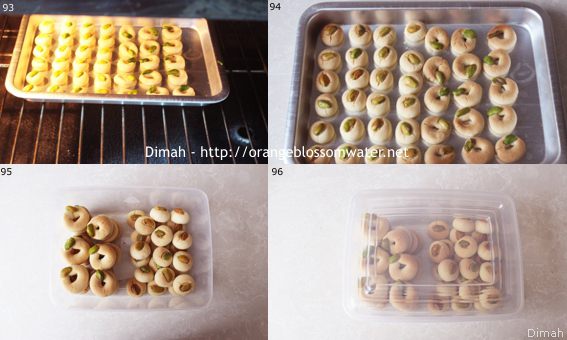 When cooled, remove from baking sheet and be careful because they are delicate. Store in airtight container. 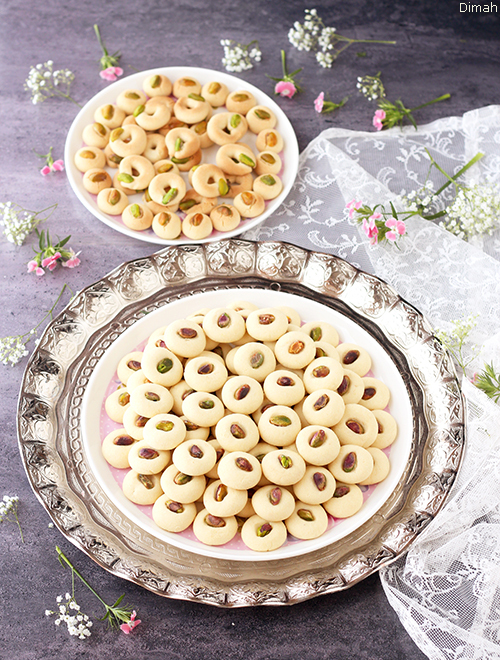 Ghraibeh Shamiyeh is same as Ma’amoul Abiad, same dough but the pieces are smaller and baked to golden brown. 69. Prepare a baking sheet. 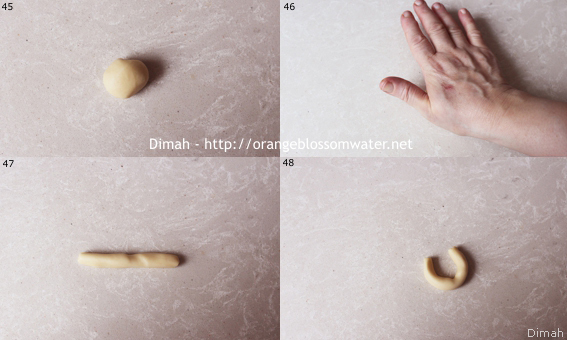 70, 71 Take a piece of dough and form it into ball, each ball equals to 4 grams. Keep the dough balls covered with plastic wrap or it will dry out. 72. 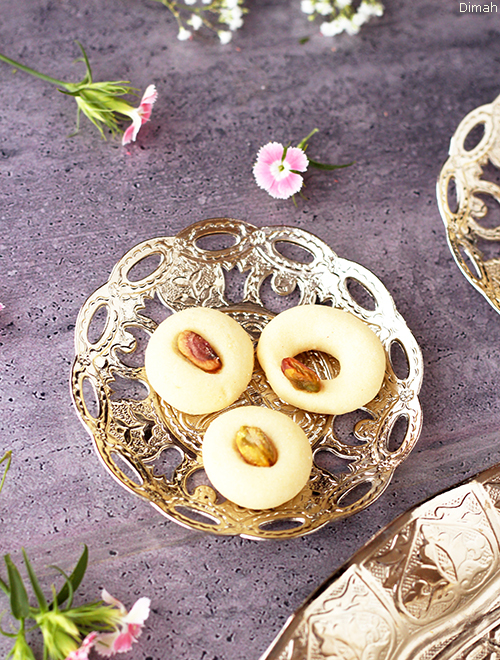 Prepare pistachio halves, and set aside. I soaked whole pistachio kernels in hot water for one hour, then removed the skin and cut it into half from the center. 73. Take a ball of dough. 74. Place on ungreased baking sheet. 75, 76. 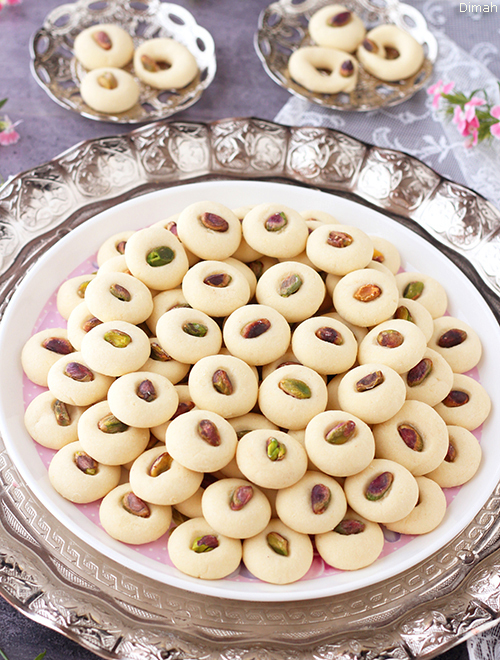 Put pistachio half in the center of the cookie and slightly press it with your finger. 77, 78, 79, 80. Repeat the steps. 81, 82, 83. Take the ball, put it on counter and with move your palm just in one direction and form it into rope equals to 2 1/2 inches (6 cm). 84, 85, 86. Form the rope into a ring joining the two ends and pressing to seal. 87. Place on ungreased baking sheet. 88, 89, 90. Put pistachio half in the joining end of the cookie and slightly press it with your finger. 91, 92. Repeat the steps. 93, 94, 95, 96. Heat the oven at 300°F (150 °C) (I’ve done this step of heating oven 15 minutes before placing the baking pan in oven to bake). Place the baking pan in the oven (rack position the second from bottom), and bake for 10 minutes or until the bottom becomes golden brown in color. Turn off the bottom burner “bake function”, then turn on the upper burner on low and bake until top becomes golden brown in color. Remove from the oven and keep on baking sheet to completely cool. When cooled, remove from baking sheet. Store in airtight container. 97. Store for one week at room temperature, after that put it in the refrigerator. 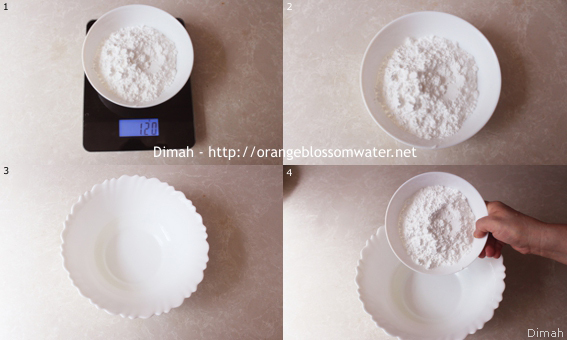 In a bowl, measure 120 g powdered sugar. Add 250 g ghee to powdered sugar. Good quality ghee is required, I used 125 g Lurpak and 125 g Aseel. Mix powdered sugar and ghee with your hand until creamy and the color of the mixture turns to pale off-white as in picture 14. 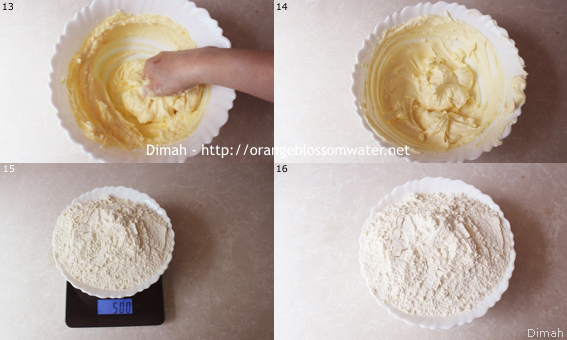 Gradually add 500 g flour to the mixture of powdered sugar and ghee, mix the ingredients with your hand between each addition. 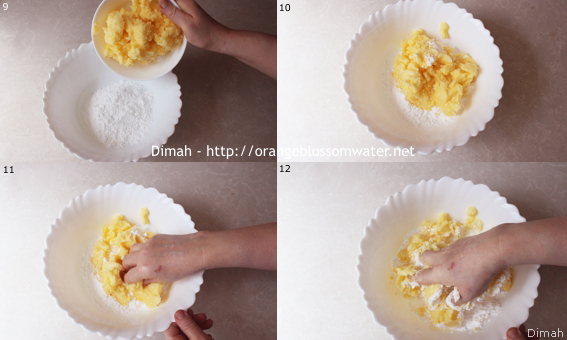 Knead with your hand until a dough comes together and homogeneous. Cover the bowl with plastic wrap, and set the dough aside in the refrigerator for 24 hours. 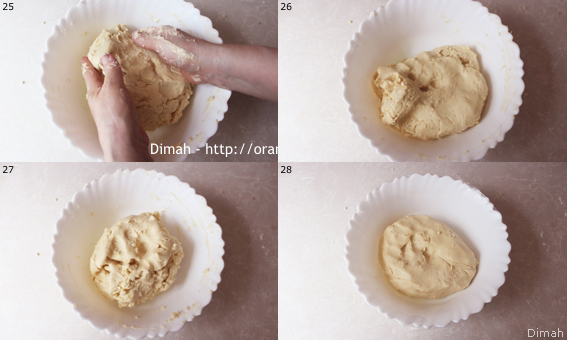 Take a piece of dough and form it into ball, each ball equals to 6 grams. Keep the dough balls covered with plastic wrap or it will dry out. Prepare whole pistachio kernels, and set aside. Put whole pistachio kernel in the center of the cookie and slightly press it with your finger. Take the ball, put it on counter and with move your palm just in one direction and form it into rope equals to 2 1/2 inches (6 cm). Form the rope into a ring joining the two ends and pressing to seal. Put whole pistachio kernel in the joining end of the cookie and slightly press it with your finger. Heat the oven at 300°F (150 °C) (I’ve done this step of heating oven 15 minutes before placing the baking pan in oven to bake). 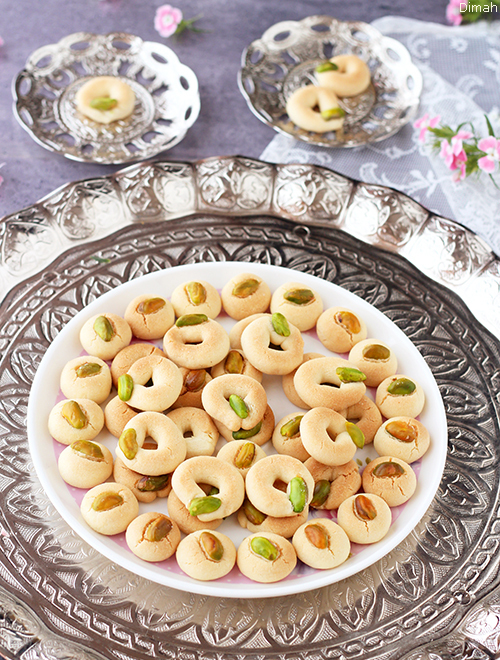 Place the baking pan in the oven (rack position the second from bottom), and bake for 10 minutes or until the bottom becomes light golden in color, Turn off the bottom burner “bake function”, then turn on the upper burner on low and bake for 4 minutes, the color of Ma’amoul should stay white. 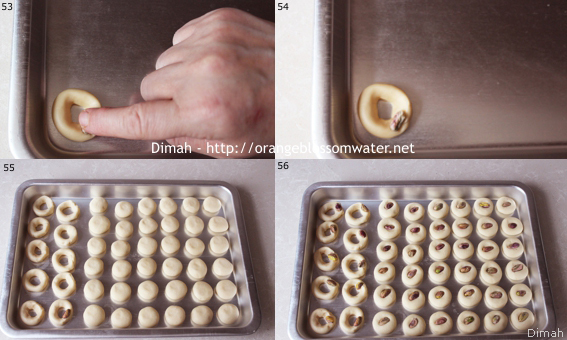 To check if Ma’amoul is done, touch with your finger and it should be clear and no crumbs stick on it. When done, turn off oven, keep Ma’amoul in oven with door open for 1 minute. Remove from the oven and keep on baking sheet to completely cool. 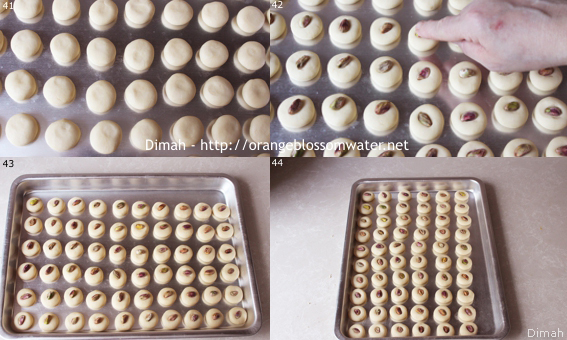 When cooled, remove from baking sheet and be careful because they are delicate. Store in airtight container. 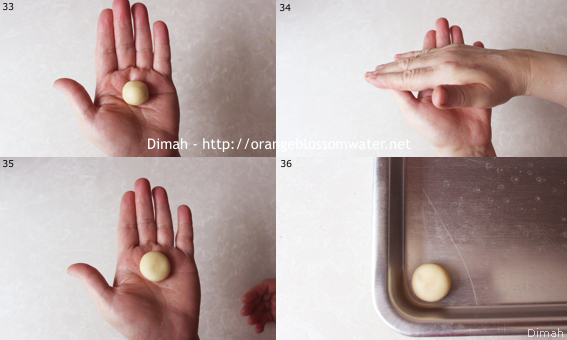 Take a piece of dough and form it into ball, each ball equals to 4 grams. Keep the dough balls covered with plastic wrap or it will dry out. 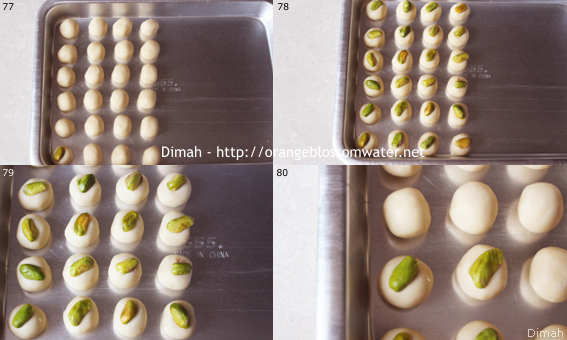 Prepare pistachio halves, and set aside. I soaked whole pistachio kernels in hot water for one hour, then removed the skin and cut it into half from the center. Take a ball of dough. 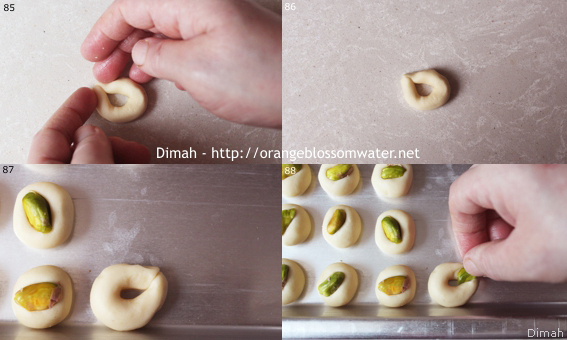 Put pistachio half in the center of the cookie and slightly press it with your finger. Take the ball, put it on counter, move your palm just in one direction and form it into rope equals to 2 1/2 inches (6 cm). 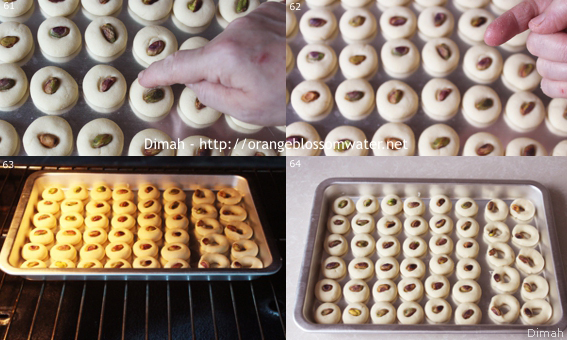 Put pistachio half in the joining end of the cookie and slightly press it with your finger. Heat the oven at 300°F (150 °C) (I’ve done this step of heating oven 15 minutes before placing the baking pan in oven to bake). Place the baking pan in the oven (rack position the second from bottom), and bake for 10 minutes or until the bottom becomes golden brown in color. Turn off the bottom burner “bake function”, then turn on the upper burner on low and bake until top becomes golden brown in color. Remove from the oven and keep on baking sheet to completely cool. When cooled, remove from baking sheet. Store in airtight container. Store for one week at room temperature, after that put it in the refrigerator. Work in a cool place. 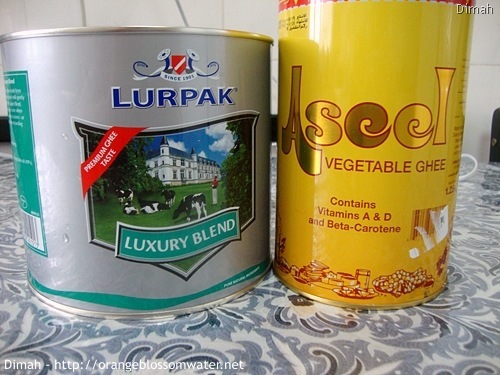 Use good quality ghee, I used a mixture of two brands, and here is the photo of the brands Ghee Brands. Be careful when baking the cookies because they might burn easily. The oven upper burner “broiler”. The oven bottom burner “bake function”. I can turn on both of them together, and I can turn off one of them and keep the other on. 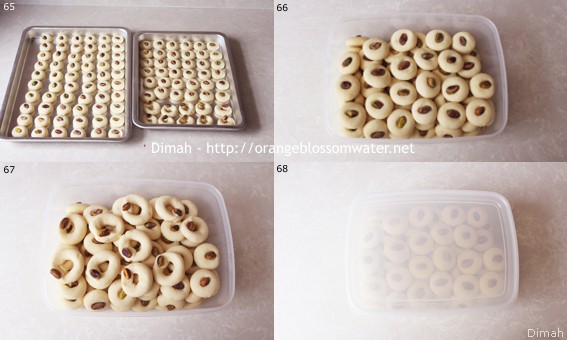 This entry was posted on Monday, August 9th, 2010 at 8:09 PM	and is filed under Syrian Baking and Desserts. You can follow any responses to this entry through the RSS 2.0 feed. You can skip to the end and leave a response. Pinging is currently not allowed. these were my kids favorite cookies for a long while; yours look so good! they are so beautifull and I’m sure , delicious!!!!! Thank you for sharing this recipe! I love these little cookies. 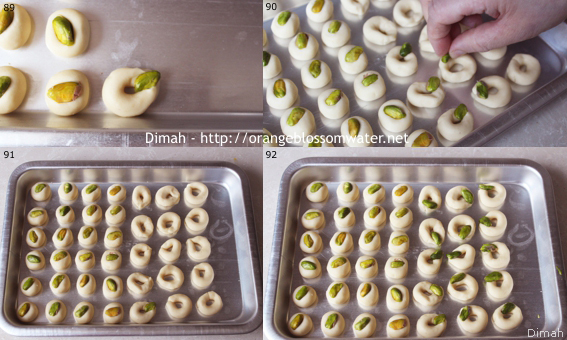 Can the same dough be used for making stuffed ma’moul (with dates or pistachios)? i love your work and i’m so happy that i’ve found ur page! keep up working my dear!!! grazi: Thank you for your kind comment! TheAmerArab Wife: Thank you for visiting! 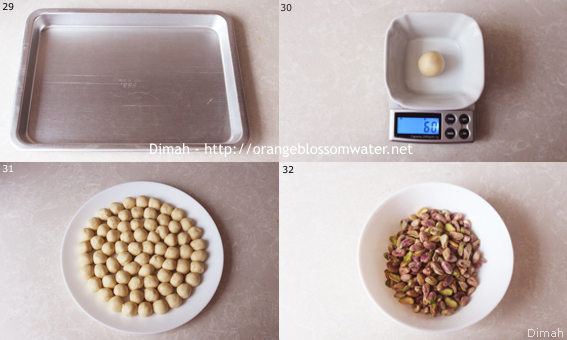 No, you can’t use this dough for other ma’moul recipes, ma’moul stuffed with dates or pistachios needs another dough. GermanSista: Wa alikum Al-Salam,Ramadan Mubarak. Yum! I want to try one! You should give these cookies a shot– they’re white chocolate raspberry macadamia cookies and they’re amazing! lovely looking cookie! thanks for sharing! So pretty and delicate! Thanks for sharing. I love the color that the ghee gives them. I love these cookies. My mother in law makes them too. Thanks for sharing the recipe and your pictures. They looks so cute. The cookies look so pretty on the rack. I love your pictures. they’re beautiful. what kind of camera are you using? What a pretty little cookie. These look delicious, and you have some wonderful pictures too! 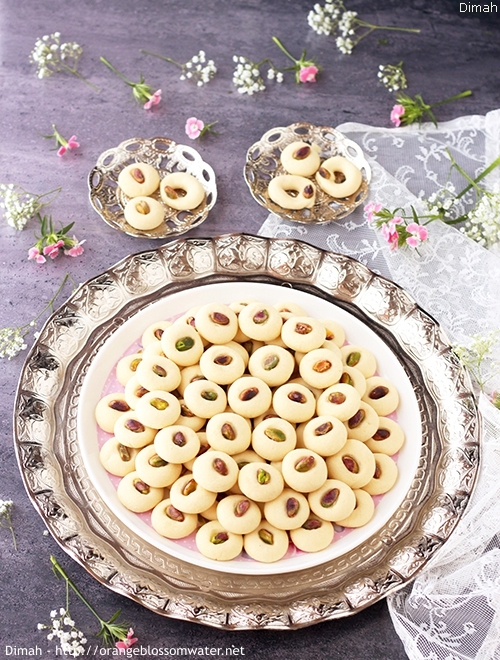 when i first read “mamul”, i got so happy:)) when i travel to middle east ,i always buy mamul, but they r cookies with dates.. i ate mamul from KSA, Dubai, Bahrain, Iran :)) all of the cookies has different , i ve wanted to learn syrian but this s not that “mamul” :)) this cookie recipe can be used for maybe that too? if i put date inside and close the dough and cook like that , do u think it will be fine? Those look so good! Love the nut topping.